In Las Vegas, a town of so many great places to eat, how does one steakhouse stand out from the pack? It’s definitely not easy. 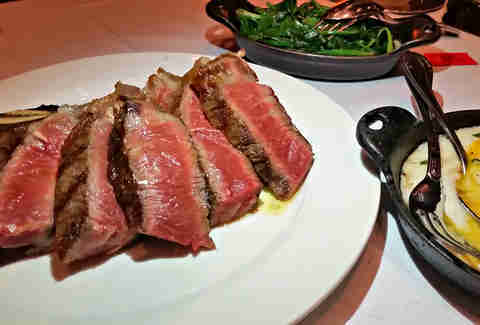 But since opening in 2008, Carnevino has continued to set new standards for serving up red meat in Sin City. In fact, we’re going to go out on a limb and say that this brainchild of Mario Batali and Joe Bastianich could very well go down as being the best steakhouse in Las Vegas... for more than a few reasons. When Carnevino first opened at The Palazzo eight years ago, Mario Batali and his team envisioned an experience where huge cuts of meat, like leg of lamb, would be carved tableside. 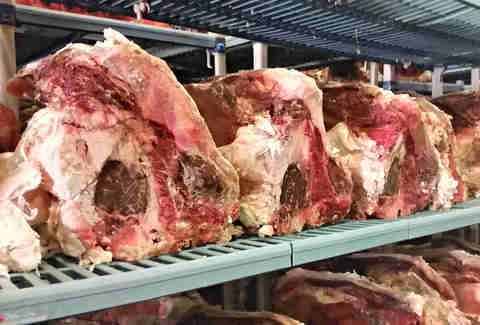 As the restaurant got familiar with the Vegas market, the team was drawn to Niman Ranch for ultra-prime cuts from cows raised humanely, without hormones, antibiotics, or non-vegetarian feed. The cows are grass-fed and grain-finished for the perfect balance of marbling within the beef. Fast forward to its time at the restaurant: each steak is rubbed with sea salt, pepper, and fresh rosemary before being served. Some are also topped off with olive oil. What about the dry-aging program? 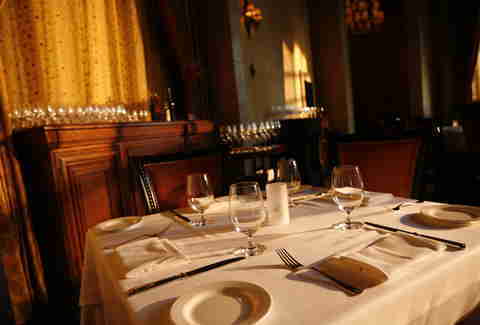 Carnevino follows the belief that if you want something done right, you do it yourself. That's why the restaurant has its own off-site aging facility near the Strip on Dean Martin Dr. It's large enough to handle about $250,000 worth of meat at any given time. Executive chef Nicole Brisson places an order with Niman Ranch every Friday. The cattle is then slaughtered on Sunday and brought to Carnevino within a week. A typical delivery can be 3,000-4,000lbs of meat. "It's hands on. I'm there every single week, touching every single piece of beef. I don't think you'll find a chef anywhere who can say that," she says, noting that most other restaurants receive their product after it's been handled by a third party. "They're buying something from a company that's already been dry-aged and cut in a warehouse somewhere. It just ends up at their door and they cut open the Cryovac bag and throw it on a plate. We're doing everything from scratch." 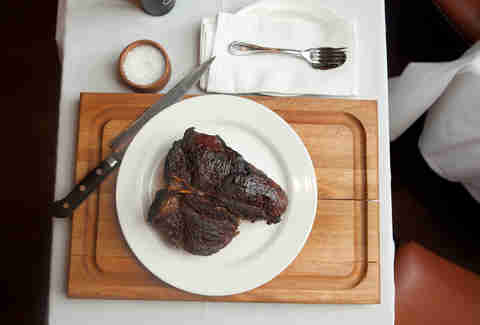 Brisson brings the meat to the restaurant three days a week, where the cuts are butchered on site. Most of her back-of-the-house team has been with her for five or six years. There's very little turnover. So what's the big deal about dry aging? 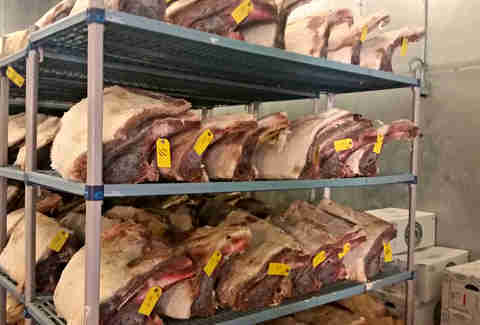 The method of dry aging was developed hundreds of years ago as a way to preserve meat. "What we've done is we've taken it up another level. We're controlling the humidity, the air flow, and the temperature," Brisson claims. "Our temperature is typically around 38 to 40 degrees, with constant arctic airflow and 85% humidity." The idea is to develop a crust on the outside of the meat to protect it. As the cut sits over time, enzymes break the meat down into a different flavor. 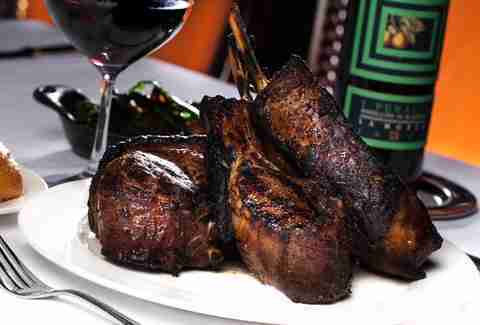 As Carnevino developed its early methods, Batali's team tasted the meat about every two weeks for four months. Industry standards for dry aging are typically 30 to 40 days, but Brisson says Carnevino was eager to explore the limits of what could be done. "We hit the 40-day mark and we had great flavor development. The texture was great, but we found that it plateaued from about that 40-day mark to the 90-day mark. That's why all of our standard dry aging is 90 to 120 days. That's more than anybody else in the country right now." 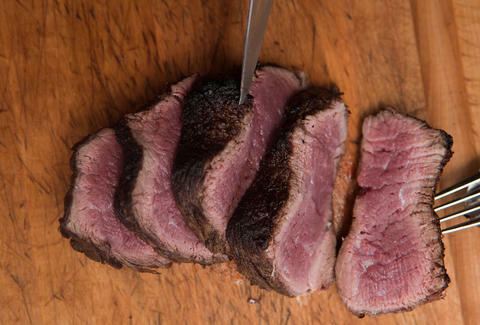 If dry aging beef for longer periods is so great, why don't more people do it? "It's a huge amount of waste," notes Brisson, pointing out that, as the crust develops and is eventually cut away, less meat is left over. "You get more shrinkage and more water loss. Most people can't house a quarter of a million dollars worth of beef in a warehouse and succeed. A smaller restaurant wouldn't be able to do that. If I didn't have Mario and Joe behind me, I would never be able to do it." 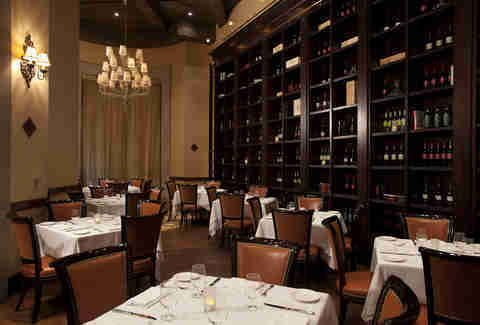 Quite simply: the off-site facility gives Carnevino the added resources to do something the average restaurant can't. "We've cut out the middle man and we're doing the labor ourselves. So it's more work, but you're getting a better product and you're able to better monitor it." "It actually was done by mistake." Brisson says it all began when a couple cuts were left behind in the back corner of the dry-aging room. One of them reached six months, and the team decided to taste it for themselves. "We realized it just had this amazing flavor profile. 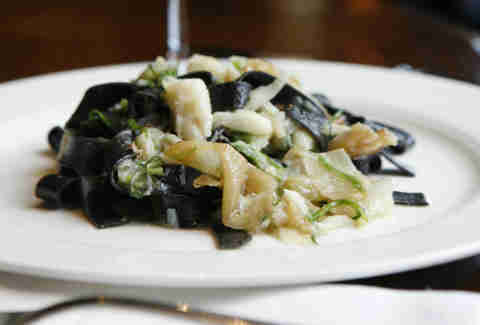 It had undertones of blue cheese and truffles, and a woodsy, earthy characteristic. Now it has a cult following." 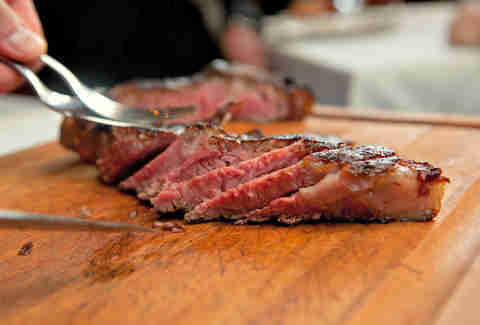 The riserva cut is dry aged for seven to eight months as an off-menu item that isn't around every day. Brisson only chooses perfect cuts for the treatment, with the proper amount and placement of fat to withstand the process and not "shrink into a raisin," as she puts it. Sometimes, she may only spy one candidate among several thousand pounds of meat. They can be a porterhouse, New York strip, or ribeye. To be real: if you want to try it, don't expect it to be cheap. Each serving is just 1-3in, with a price that generally ranges from $120 to $240. Despite the high price, the riserva is geared to true steak connoisseurs, not just high rollers who simply want to throw their money around. "It's not for the faint of heart. It's rich. It's very, very flavorful." So how does someone actually get their hands on a riserva cut? Sometimes, guests will correspond with Brisson by email before booking a reservation. She hands out her card a lot. People often call the restaurant in the morning and ask what is available for the day. The riserva cuts tend to sell out quickly. If they're gone by Friday, they will remain unavailable for the rest of the weekend. "It causes quite a few angry customers," she says. "But it's worth it for the people who understand it." In case you're interested in the cut: deliveries come to the restaurant on Monday, Wednesday, and Friday. Give them a heads up a day earlier, and your chance of scoring a riserva cut goes up significantly. What else is there for a red meat fix? Can't decide on what to order? There's a solution for that. The tasting menu for beef is a set multi-course meal with a little bit of everything, including cured meat, the Carne Cruda steak tartare, a meat-filled pasta such as a beef ragu, a wet-aged steak, and of course, a dry-aged selection. The Lamb Chops Scottadita is another option that shouldn't be overlooked. They're cooked with the fat caps on, allowing the meat to baste and be juicier -- and maybe even a little messier than you are used to -- with a dried-mint-and-lemon rub to create an explosive flavor that's unlike anything else you'll find on the Strip. 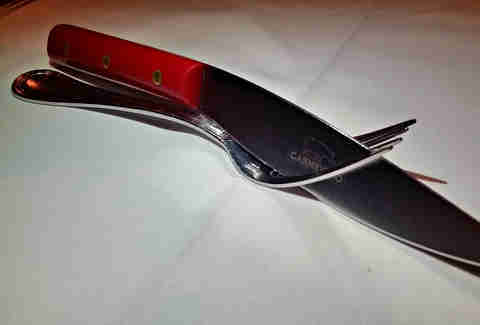 Each one is crafted in Italy, with a distinctive engraved red handle that, depending on who you ask, costs anywhere from $75 to $100 each. They are carefully counted and locked away each night. If one goes missing, there's probably a serious discussion taking place. There's plenty of pasta on the menu, and while it may seem odd to combine a steakhouse with an Italian restaurant, as Brisson points out, the concept is nothing new for Italian families used to having a variety of courses. "You can have that whole Italian table experience where you're having a great antipasti, a fresh handmade pasta, and then going into a beautiful, rich, dry-aged steak." And sure, the wine list focuses on Italy as well, though it also has an international depth, with impressive choices from Slovenia, Portugal, and Argentina. The Ricotta & Egg Raviolo is proof that less is more. While the average Italian joint will load up your plate (and stomach) with pasta, this dish is simply a single large ravioli in brown butter, filled with authentic ricotta and an egg that cracks open into a runny yolk with the touch of a fork. Each bite is something special. 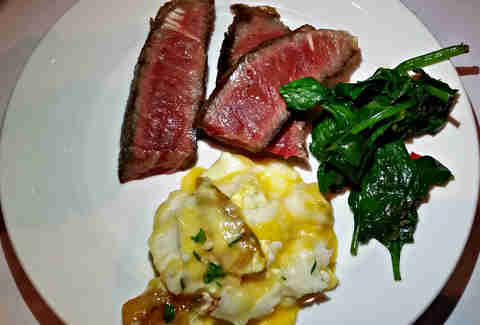 Plus, the Mascarpone & Guanciale Mashed Potatoes are the best take you'll find in Vegas on the common side dish. It comes topped with a lightly poached egg, which somehow seems to work. This all sounds great. So where's my table? The dining area is impressive, with three distinct rooms, including an intimate "wine cellar" with a low ceiling that runs directly under two escalators on the Venetian's lobby floor. A fourth dining room, known casually as "the library," is across the hallway and repurposed from an old storage closet. 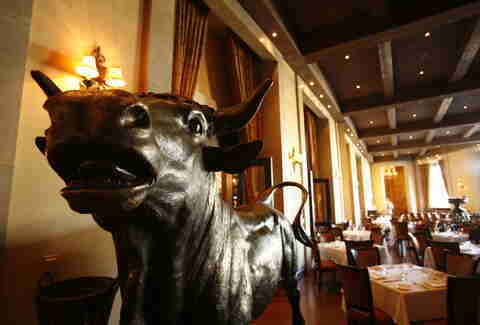 The main dining room is elegant, with long drapes, a 20ft-tall modern ceiling, wine bottles scattered throughout the venue, and a giant statue of a bull in the center. He's modeled after Bodacious, a famous rodeo bull. The statue is life-sized, anatomically accurate in every way possible, and has been placed around the restaurant in different spots over the years... even in the hallway outside, on the casino floor. Naturally, that didn't work out so well with the late-night Vegas crowd. (You can only have so many people looking for a ride after a few drinks.) So, yeah, the bull got moved inside. Anything else I should know before I make my reservation? The music isn't the usual piano and violins you might hear playing at your typical fine dining establishment. The selection comes directly from Mario Batali's own iPod playlist from when he was starting out years ago in a tiny New York kitchen. It features a wide range of rock, from the Rolling Stones and Led Zeppelin, to Black Sabbath and The White Stripes. So, can you find a better steakhouse in Vegas? Probably not. 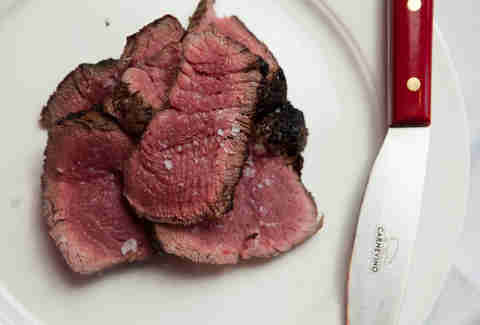 Rob Kachelriess likes his steaks medium rare and his vegetables well done. Follow him on Twitter @rkachelriess.